Q: How early do I start talking to my young child about drugs/alcohol? What should I say? 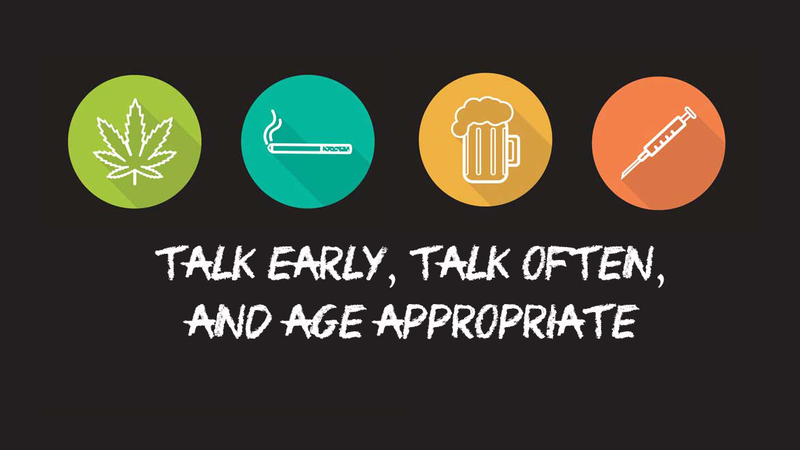 A: Conversations need to be early, often, and age appropriate. The easiest message to give children of all ages is to model appropriate drinking behavior: having a glass of wine with dinner, not a bottle; have a beer, not a six-pack. Use your young child’s natural curiosity when they ask, “Can I have a sip?” to let them know that alcohol is for adults. Keep it simple and consistent. In addition, parents can watch for teachable moments. When something alcohol-related comes up on television, or something you’ve heard is worth discussing, start with the phrase, “I heard,” and then ask your child what they think. “I heard the the girl in the movie say all her friends drink. Do you think that is true?” Encourage an open dialogue void of judgment or shame, and strive to always stay informed. Follow community organizations on their social media accounts, since they often include tips to foster communication, such as Hanley Foundation’s Facebook page and Twitter accounts @HanleyFndn and @TwinzTweet. Q: How do I encourage my pre-teen or teen to fend off peer pressure? If you turn a potentially negative situation into a positive, your child won’t feel like a victim, and he or she will gain confidence to continue doing what’s right. Find a positive in every situation, and point it out to your child along with your clear, no-use message. “As a family, we follow the law, and the law is clear that drinking before the age of 21 is illegal,” is a good phrase to use. Keep it simple. Teach kids to just say, “No, thank you” or “Maybe later”, when offered something to drink. Remind your children that most kids don’t drink. In fact, 80 percent of Palm Beach County youth do not drink, therefore everyone is not doing it. Q: What are the new designer drugs or alcohol trends for kids that I need to be most worried about? A: The actual trend in our area is that 80 percent of Palm Beach County students do not use alcohol! Each parent can support this trend by sharing this information with others and with their children. Acknowledging that trends are always changing is a great first step to staying informed. Parents should feel empowered to ask questions and initiate conversations often about drugs and alcohol. Parents can ask, “What kind of designer drugs are you hearing about being used at your school?”. Or “I heard that some of the kids at your school are using alcohol. How do you feel about that?” When parents see something on the news about a new designer drug, consider it a teachable moment and ask your child if they have heard about it. This gives parents an opening to give clear messages like those from Palm Beach County Substance Awareness Coalition: “Be smart;” “Don’t believe the hype;” and “Don’t be a guinea pig.” By staying informed, parents can feel confident that their messages are in line with field experts and current trends. Q: How do I know whether my child is using drugs/alcohol? A: Listen to your instincts! If you feel or think something is wrong, then something is wrong. You may not know what it is, but if you believe something is wrong, definitely investigate. Start by talking with your child and sharing the observable behaviors you are seeing, while expressing your concern in a loving and supportive tone. Remember, no one loves your child more than you do – make sure your child understands how important he or she is to you. Be calm, be clear, and be consistent with your message, and don’t give up. Q: What can I do to help protect my child? A: Family time is always time well spent! It is important that parents recognize their role in prevention. Family meals are one of the greatest tools a family can use to protect kids from risky behavior, including alcohol and drug use. If you are not having any family meals, then start by having one per week, with a goal of seven family meals per week. Breakfast and lunch count, too! The CASAColumbia (CASA) 2012 Family Dinners White Paper revealed that when compared to teens who have infrequent family dinners (fewer than three per week), teens who have frequent family dinners are almost 1 ½ times likelier to say they have an excellent relationship with their mother and 1 ½ times likelier to say they have an excellent relationship with their father. In addition, parents of pre-teens and teens should create a code word or phrase for their child to use if they find themselves in an uncomfortable situation and they need a safe way out. For example, you child could call you to say, “Mom, my migraine headache is coming back.” Then you as the parent will quietly ask key questions: “Are you afraid?” and “Are you where you said you were going to be?” and “I’m on my way to get you. Do you want to stay on the phone until I arrive? If not, I will text you when I am outside, and you can meet me.” These options will give your child a safe way to bow out of a situation without generating unwanted attention. Q: If I suspect my child is using, where do I turn for help? A: If you are concerned that your child is under the influence of a controlled substance, call 911 or take them to the emergency room. Seeking immediate medical attention can lower their risk of a possible overdose, or long-term side effects that could impact well being. If you suspect your child is using a controlled substance but is not presently under the influence, call the 211 Helpline. The Helpline is a free service that can direct you to available resources and programs, depending on your specific situation. This community helpline and crisis hotline provides suicide prevention, crisis intervention, information, assessment, and referral to community services for people of all ages. Additional trusted community resources include school guidance counselors, and your primary care physicians, both of whom likely have a history and understanding of your child’s unique needs. If your child came home with a “C” on his forehead due to cancer, what would you do as a parent? You would reach out to everyone you know and find every resource available to provide the best treatment possible for your child. If your child came home with an “A” on his forehead due to addiction, what would you do? It is important that parents acknowledge that addiction is a disease greater than you have the ability to treat. You wouldn’t try and treat your child’s cancer, so don’t try to treat your child’s addiction. If you have concerns, make sure a professional evaluates your child. Individuals and families living in Indian River County, Lee County, Martin County, Okeechobee County, Palm Beach County, and St. Lucie County can call 211. If out of the area, call (561) 383-1112 or 1 (866) 882-2991 to speak with a highly trained resource specialist. Calls to 211 HelpLine are answered 24/7 and are free and confidential.